Modern construction is pale and dusty. Grey piles of sand and gravel, rusted steel, stacks of white cement bags, and piles of dirty scrap wood with long nails sticking out. That is the image of a modern construction site for even a small single family house. Later on people will live in it. They breathe the air through the windows, sleep with their cheeks on the floor, seek shelter from storms and rain, do their homework, and cook their food for many years. Most people will spend most of their life living in a single house. This central role gives the house a bigger meaning, it makes it a home. Although the house is just a material object, a home plays such an essential role in our lives that it has to suit the requirements of the people inhabiting it. Throughout evolution man has used natural resources to create things that are adapted to human need. Since the industrial revolution man has witnessed a reverse process taking place. Instead of experiencing a higher quality of life, many of the unanticipated side-effects of the industrial revolution have caused a decline in human quality of life. We are forced to live in higher population concentration, have many adverse effects resulting from pollution, and have found natural diversity disappearing for the sake of economic simplicity. Even small and basic houses, built from concrete, require immense resources that upstream the production process of cement-based building materials. We are commonly accepting the uncomfortable side-effects of working on cement-based construction sites as modern standard without asking or looking for alternatives. Concrete is a cold building material that does not suit the divine free spirit inside of all of us. We are at a point in evolution where we cannot deny the advantages of cement-based construction, but we should not feel intimidated to refrain from more natural alternatives. Traditional buildings inspire human values and nurture our aching hearts. How much happiness can a single plant give us, when we find ourselves lost in the midst of an urban jungle? Similarly, changing the materials and methods used for the construction of our homes can have a positive impact on the way we feel about our lives, our family, and the environment we live in. Some of the tribal people in rural India still maintain a huge range of different traditional building techniques that infuse us with warmth and dreams of a simpler world. Such, was my experience when visiting Gudipadu Cheruvu in Andhra Pradesh for the first time. The traditional buildings are round huts built from stacked slate rock with conical branched roofs. Inside of such a house you feel like Mother Nature is giving you shelter under her sari. Of course, that means that some rain might come through during monsoon, and you might have some problems with keeping everything perfectly air tight during a storm. However, you are always enjoying a naturally ventilated and relatively cool space for hot days and nights in one of the driest regions in India. I am a Mechanical Engineer from Germany who has great affection for the Indian cultural heritage and, in particular, for the peaceful ways of tribals living in harmony with nature. At the same time I understand the demands of urban society for complete shelter. Nowadays, tribals are looking up to those who live in the cities for their wealth and technology. Those in the city are inclined to envy the simplicity and peacefulness of people in isolated areas. We are at a point in evolution where we should combine natural building materials with industrial products to cope with the challenges of hygiene and extreme climates with an increasing population all around the world. There are numerous techniques to build on traditional techniques to achieve both comfort and performance. In this article I will present the next stage in the evolution of traditional mud blocks called Compressed Stabilised Earth Blocks (CSEBs). 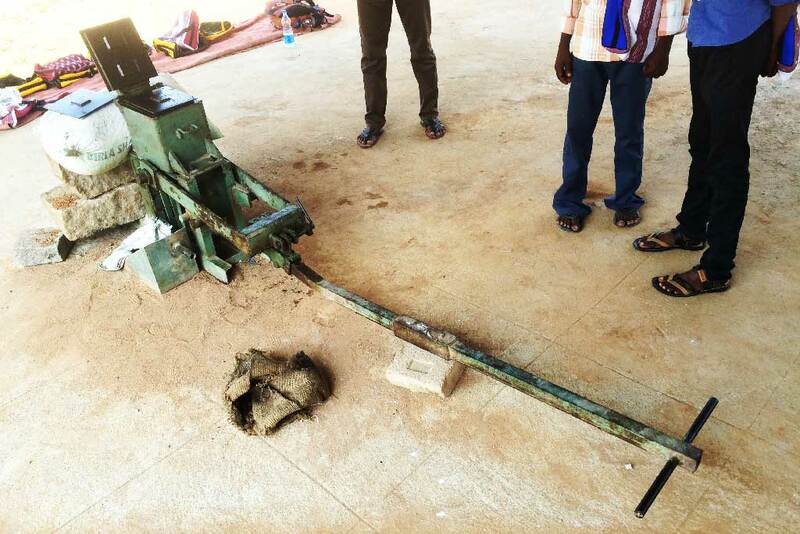 To learn about this modern and eco-friendly building material I accompanied several villagers from Gudipadu Cheruvu, AP, and another village in Odisha to a workshop on producing such blocks at the National Institute of Rural Technology in Hyderabad, Telengana. The National Institute of Rural Technology (NIRD) is a government funded research institute examining the factors that affect the economic and social well-being of India’s rural population and supporting rural development focusing on the poor and disadvantaged through consultancy and education. It is one of the main advisories to the government of India for rural development. Part of the magnificent campus is a very charming Rural Technology Park (RTP), where several modern village industries are exhibited in small village-inspired architecture, showcasing the full production cycle of various products ranging from soap and washing liquid, to organic fertilizers, herbal products, soy pappad, and even state of the art solar powered lamps. Another area of the RTP is dedicated to various building technologies ranging from traditional housing from all parts of India to Laurie Baker’s human-centred, environmentally friendly and economic housing models. Laurie Baker was an architect who was born in the Netherlands in Europe and died as Indian national in Trivandrum, Kerala. He made simple, efficient, and comfortable housing for the poor one of his life’s greatest missions. At the core of his designs are a small number of basic methods, which can not only reduce the cost of construction, but also create a much more human and environmentally-friendly habitat. 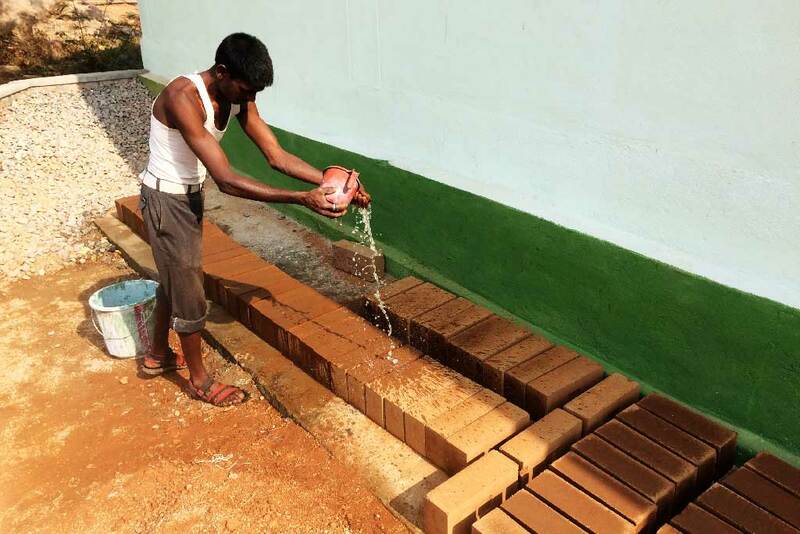 It is in line with this philosophy that the RTP offers training workshops to villagers in masonry and other elements of construction to spread awareness and skills to those who can benefit from it the most. 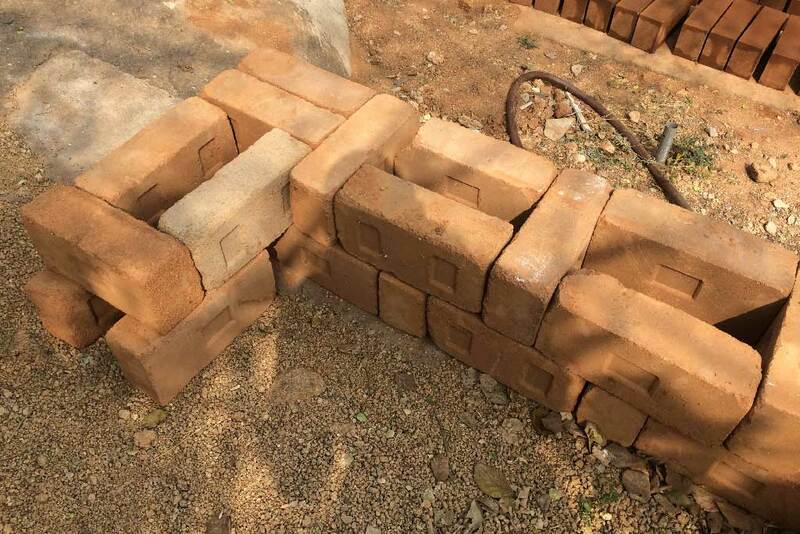 Part of this programme is a workshop on manufacturing Compressed Stabilised Earth Blocks (CSEBs), which is a building material that is a modern version of something that has been used throughout history in most parts of the world. Mud blocks have the advantages to be simple and cheap to produce, as well as are proven to have excellent thermal insulation and comfortable feel. They are mud poured or slammed into moulds, then sun-dried and used for the construction of housing walls. The main disadvantages of plain mud blocks are their lack of water resistance and high compressive strength, typically required for new modern buildings. CSEBs on the other hand address these shortcomings efficiently with a small fraction of additional ingredients and high compression in the mould. The primary ingredient remains common earth with a clay content in the vicinity of 20% and a sand content of at least 50%. This is combined with a small fraction of cement (8% is typical) and lime-wash (2% is typical). These ingredients are thoroughly mixed in dry form and then water is added to make a moist and sandy mixture. This is filled into the mould of a fully manual brick press, then compressed by pulling a long lever, and finally allowing a compressed brick to be ejected, which is subsequently put aside for curing. Due to the high compression in the machine of approximately four metric tons the bricks can be stacked after 24 hours of manufacture to save space and save water for wet curing. Complete curing takes place over 28 days whilst keeping the brick slightly wet to achieve maximum strength. Due to compression the final brick has fixed dimensions and requires only very little cement to achieve high compressive strength and excellent water resistance. This allows the bricks to be used for single thickness walls that do not require plastering. The natural colour and smooth surface of the bricks give a clean and comfortable feel, whilst being aesthetically pleasing. In short, it is an excellent building material. CSEBs are a prime example for a traditional building material that was adapted to modern requirements by incorporating a small fraction of industrial produce and employing simple, yet specialised, equipment. These building blocks can be easily used as a substitute for the commonly precast concrete blocks. Concrete as a building material is very cold and unemotional. Although it is very practical for elevated structures requiring high structural integrity and easy moulding of floors and roofs, it should not be used beyond necessity for several reasons. The production of cement, which is the active ingredient in concrete, requires extremely large amounts of energy for production. Here temperatures in excess of 1,300 degrees Celsius are needed. Also, cement is very toxic due to its high alkalinity and immediate reaction with water, which can cause many negative long-term effects in those transporting and using it. Furthermore cement structures take a very long time to be degraded naturally on abandonment. This might not be an immediate concern to a construction company or a private investor, but this is part of our social responsibility. It is understandable that many people desire high strength building blocks, which provide high water resistance, but cement based construction is not the only answer to that demand. CSEBs have the thermal insulation properties of a traditional mud block that a person living in a concrete block house can only dream of: a compressive strength matching or exceeding standard concrete blocks, an aesthetic appearance and natural feel that gives comfort and peace, as well as being potentially cheaper when produced locally or on site. The only disadvantages are the need of specialised equipment and the availability of suitable soil. 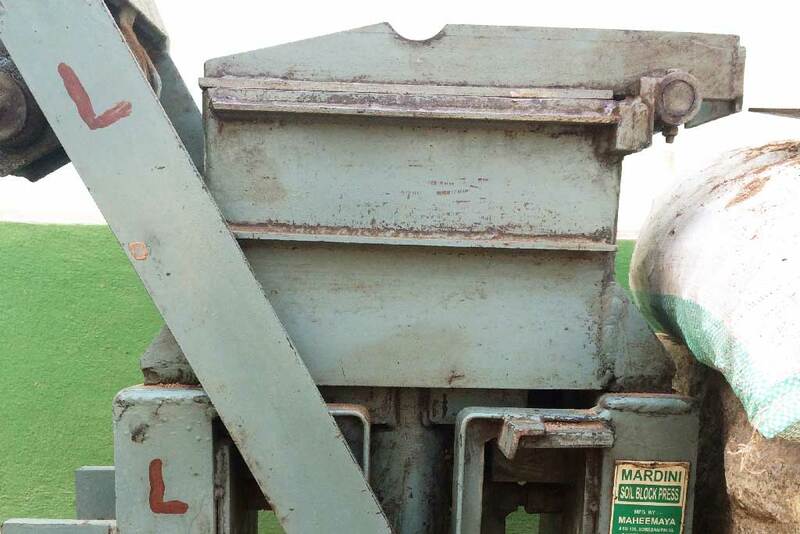 Prices for CSEB presses start at 1.4 lakh rupees. Many places will have suitable soil. The acceptable limits of clay and sand content are quite large and may even be compensated for by adding quarry dust, or varying cement content, which potentially reduces cost-effectiveness slightly. The CSEB is not the ultimate standard building material for an entire nation as diverse as India. It is a very effective adaptation of a traditional technique to modern standards and processes. Therefore it is an example for positive integration of cultural heritage in modern life. Traditional techniques may seem discouraging due to their natural variations and difficulty to standardise, but they make up for it with extreme living comfort and environmental friendliness. Society’s goal should be to uplift humankind to a greater quality of life rather than compromises in living. There are thousands of years of cultural heritage revealing many different applications of naturally occurring materials. Even if CSEBs do not apply to a particular region, there will be many traditional alternatives available to achieving the same function, such as slate rock, natural rock, or natural laterite bricks (locally known as Vettukallu) found in Kerala and Karnataka. These can be adapted to specific requirements, by including them in modern construction with some cement-based features, but at least adding diversity and comfort to potential cost-effectiveness and environmental friendliness. We are building more than just houses. We are creating homes for people with hearts.